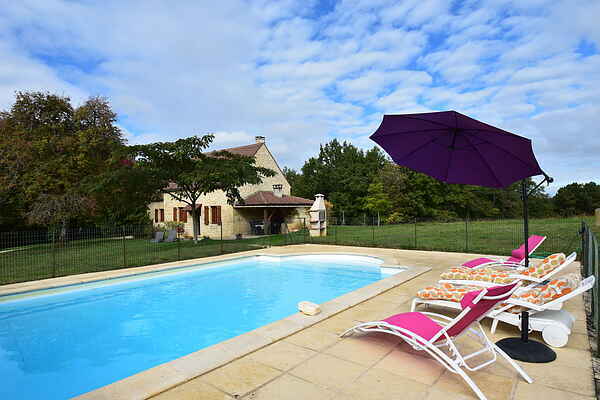 This 19th-century Périgord house been completely renovated into a beautiful holiday home. Original features have been carefully preserved. There is a beautiful, authentic sink and the partially covered terrace has an old bread oven and barbecue. A wonderful setting to enjoy a culinary evening. Take a refreshing dip in your own private pool or enjoy relaxing on one of the sun loungers. The kids can enjoy themselves tremendously, there's plenty of room! The interior of the holiday home is smart and mostly decorated in local style. Some details such as the large original fireplace have been preserved. Don't miss a visit to Cahors (22 km)! This beautiful medieval town is also known for its splendid 'Pont Valentré' from 1308. Go shopping and dining, and also taste some of the dark, heavy Cahors wine. The area of Gourdon (20 km) offers everything: visit the Caves of Cougnac, play a game of tennis, go horseback riding or go for a swim in the lake. A very scenic route will take you to Rocamadour (40 km). This beautiful medieval town is at its most magnificent in the morning sun, when the houses seem to come straight out of the rocks!